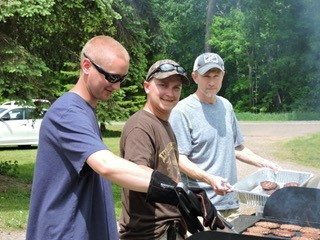 Employee-owners from Border States’ Albertville, MN, branch were among the volunteers who provided food and fellowship for approximately 40 military veterans during the recent Walleye Tour on Mille Lacs Lake in Aitkin, MN. The annual event is coordinated by Band of Brothers Outdoors, a nonprofit that helps veterans enjoy outdoor experiences and favorite pastimes through recreational therapy. Peace lives in the most curious places. A group of military veterans and Border States volunteers recently discovered it in a fishing boat. (From left) Austin Eakman, Reid Eakman and Daniel Essig, of Albertville, grill for vets. Band of Brothers Outdoors, a nonprofit that helps military veterans enjoy outdoor experiences and favorite pastimes through recreational therapy, held its second annual Walleye Tour in early June. The event took place at Doc’s Harbor, a lodging site on the north shore of Mille Lacs Lake in Aitkin, MN. Volunteers from Border States’ Albertville, MN, branch were among the volunteers who provided food and fellowship for approximately 40 veterans.